Effective September 1, 2018, Federal Motor Vehicle Safety Standard 226 (FMVSS 226) established requirements for ejection mitigation systems to reduce the likelihood of complete and partial occupant ejections through side windows during rollovers or side impact events. The standard applies to all passenger cars, multipurpose vehicles, trucks and buses with a GVWR of 4,536 kg or less. The auto industry responded by switching side windows to laminated glass and moved away from safety or tempered glass. This change is expected to add 17 million new vehicles per year to America’s roadways with laminated glass side windows. Fire/Rescue and law enforcement officers now have a new challenge! Glass management will now require both punches to shatter tempered/safety glass and laminated glass cutters. Punches will not shatter laminated glass. A second issue related to patient safety requires the use of non-intrusive blade systems on side windows to avoid striking patients or uncooperative suspects while removing glass. 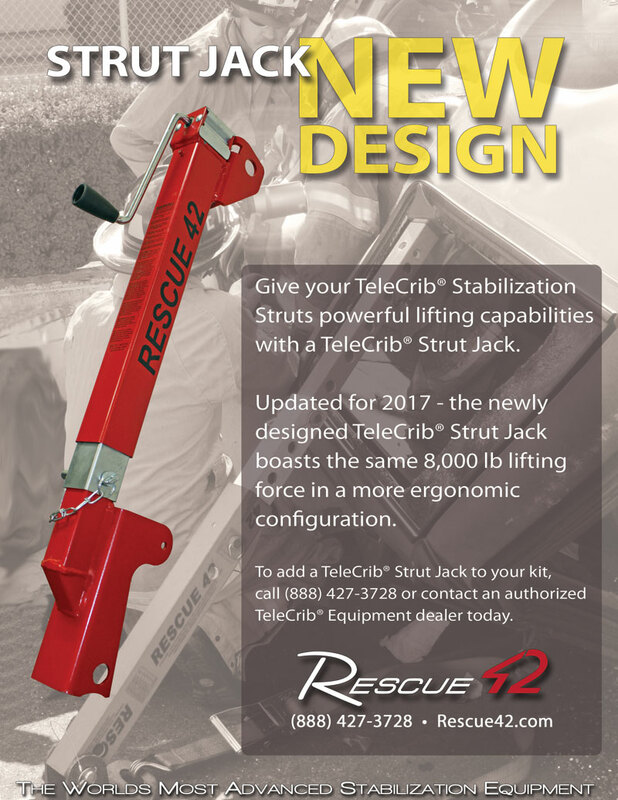 Rescue 42, makers of market-leading Telecrib® stabilization equipment, announces the introduction of our newest product—The Ripper™, a laminated glass cutter that is designed specifically for fire & rescue teams, as well as law enforcement officers. “The Ripper™ is designed to interface with several popular impact drivers. Departments can select the driver make and model that conforms to their choice of battery systems. “The Ripper™ does not use proprietary batteries—instead it uses readily available batteries in use by many agencies today,” said Mike Bechtol, Chief Commercial Officer of Rescue 42. “Our laminated glass cutter sets itself apart with its, blade tips designed to punch a starter hole, 360° swivel ability, integrated resqme® glass punch and seatbelt cutter, LED flashlight, up to 7.2”/second cutting speed, durability, 3 year warranty and Rescue 42 quality that you have come to trust over the past 24 years,” said Tim O’Connell, CEO of Rescue 42. The Ripper™ is available for purchase through our Distributor Network. Contact a dealer to find a distributor in your area.